The shipping container project grew out of a discussion over lunch in Sydney, in 2011. Marilyn Havini and Dorcas Gano, founding members of HWC, were visiting Australia and catching up with friends who shared an interest in Bougainville - Meg Hoskins and me (Helen Dakin). Inspired by their plans for a Resource Centre for Hako, we asked what materials they would need, made a list, and decided to start getting some things together in Sydney. The start of a very long story. Near the end of 2011, the project really got going with some major donations from Lesley Lewis and others in the community of Jamiesontown Public School in Penrith. They provided a wonderful collection, starting with a large set of heavy mechanic's tools, hundreds of books, boxes of teaching resources and other educational materials as well as fabric, clothes and other useful items. In 2012, Hona Holan and Ruthie Sawa of the HWC came to Sydney and we visited Jamiesontown school to thank them for their help, receiving a wonderfully warm welcome. Hona and Ruthie were very interested to have a tour of the school and to see how the classrooms were set up - and we were all impressed with the electronic whiteboards! Other donors provided paint, filing cabinets and office furniture. I had been in the process of moving house and had rented a storage space which we set about filling up. We found a tremendous amount of goodwill and eagerness to help, especially from people with a Bougainville connection, which was really encouraging. But as the collection expanded towards shipping container size and storage payments mounted up, the nagging issue was how to get it to Buka. Many people and organisations generously gave money for the shipping costs. In late 2013, NSW Parliament organised a special screening of the film Mr Pip which raised around $1500. In all, we received just over $12,000 in donated funds. We must have contacted every company offering any kind of shipping or container service; we spent many hours on the phone. Several times we were almost at the point of agreement with a shipping company, only to be told at the last minute that they would not take the job after all. Finally we were able to arrange shipping by Swire Shipping, where the wonderful Carla helped us through the complex and mysterious world of international shipping. Even so, there were some false starts. On the first attempt, the container did not get to the ship because we didn't know until the last minute that we needed a driver with clearance to enter the port, and at a that point none was available. We had to change the booking and try again for the next ship. The next attempt looked doomed when the driver arrived to collect the container in a vehicle that was almost a road train, and not designed for suburban streets with tight corners. When he saw the entrance to Addison Road he shook his head at me darkly - but he managed it and without even a scrape! 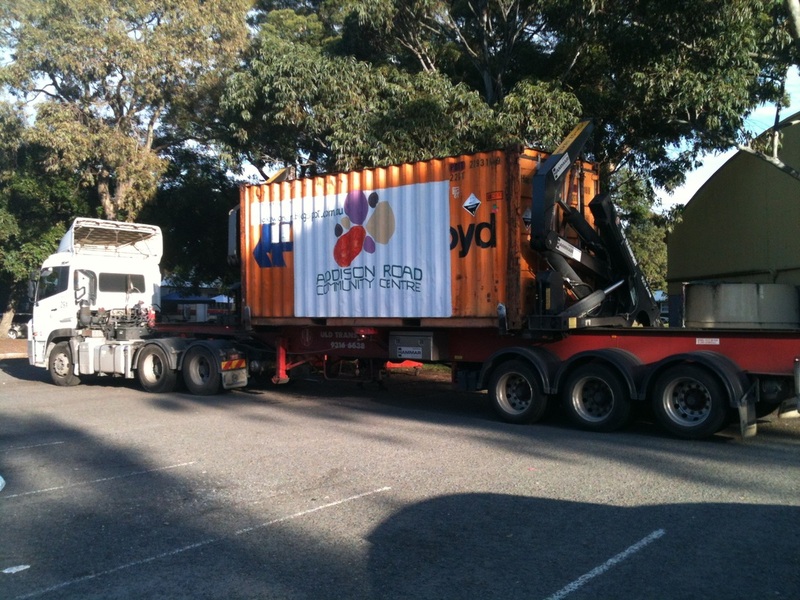 So we farewelled the container with great relief and it finally left Sydney. We always knew the most difficult part would be getting the materials transported to Buka - and this was certainly correct. Trying to organise a shipping container really brought home to me the difficulty and expense of transporting things to or from such a remote place. Doing it as a one-off transaction adds a lot to the degree of difficulty. Our first approach was to a union, as Australian unions had helped to send several containers of medical and other supplies during the war of the 1990s. Unfortunately they were no longer able to help. It took several years and a lot of ringing around to find a solution. Meanwhile, in 2013, the Bougainville Women's Federation had obtained a grant for a project to build and establish an office incorporating meeting space, a cafe and public toilet, beside the market in Buka Town. As with the HWC Resource Centre, income from the cafe and rental of meeting space will provide income to pay the costs of maintenance and administration. Nina Boydell, an Australian volunteer, was recruited by Australian Volunteers International to work with BWF and mentor the women establishing the new cafe. Before leaving Australia, Nina kick-started the process of fundraising for shipping costs, and collection of equipment and crockery for the cafe. With the donated funds we purchased a used shipping container, which could be used or sold at the other end. 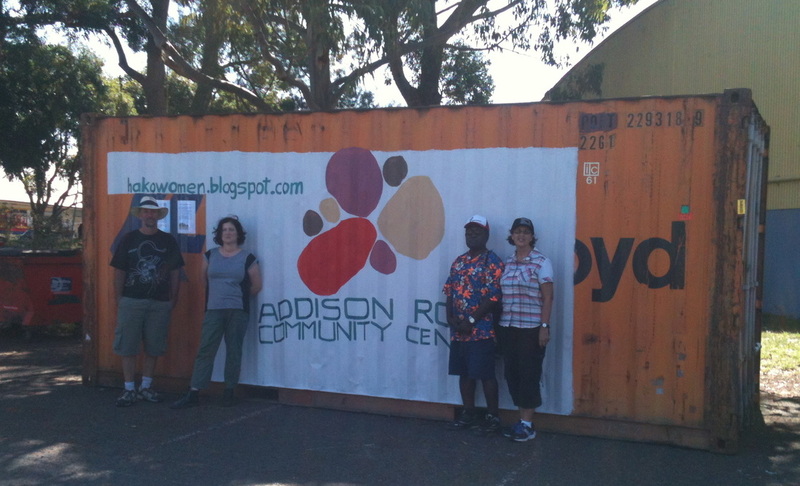 The Addison Road Community Centre in Marrickville kindly allowed us to park the container on their site, and were wonderfully supportive. This made it possible to move the collected goods out of storage, although we still didn't know how we would ship it over. We painted the container and posted up information about the project and about HWC and BWF. So far so good, but when the container was unloaded at Lae, PNG new problems began. Before it could be lo​aded onto the next ship for the journey to Buka, the container needed to be cleared by Customs and Excise. BWF had taken on this issue, and it turned out to be far more onerous than anyone had expected. Basically, we needed clarification as to what duties or other taxes were applicable, and were seeking an exemption from any such fees because of the nature of the material and of the organisations that would receive it. The application could not be made until the container had left Sydney, and for five months, while correspondence flew in all directions, the container was stranded on the wharf at Lae. This had been our great fear, as there was a high risk that people would break into the container and start looting it. We were also worried about possible extra fees resulting from the delay. Eventually the decision was made and the container was released for onward travel.